Testing out a modified eyepiece adapter today, I had the vintage Cooley Telescope pointed at the Sun. Since everything was set up, I decided to see whether we could capture decent images of our nearest star, near noon on this clear summer day. While the sky was clear, the seeing — quality of the view — was not as good as I’d hoped. Apparently, midday heat was causing the image to “shimmer” in the eyepiece and the photographs reflected that. Examining the pictures on the computer screen, I was disappointed because I saw no details in the several sunspots visible. As I made some photographic adjustments, however, other features came into view: granulation and faculae! The granules, upwelling super-hot cells of solar atmosphere, are easy to see; they give the image above a “grainy” appearance. Faculae are a bit trickier but if you look along the darker right-hand edge of the solar image, you will see some light-colored patches — those patches are faculae! So a bit of disappointment changed to a sunny day surprise. 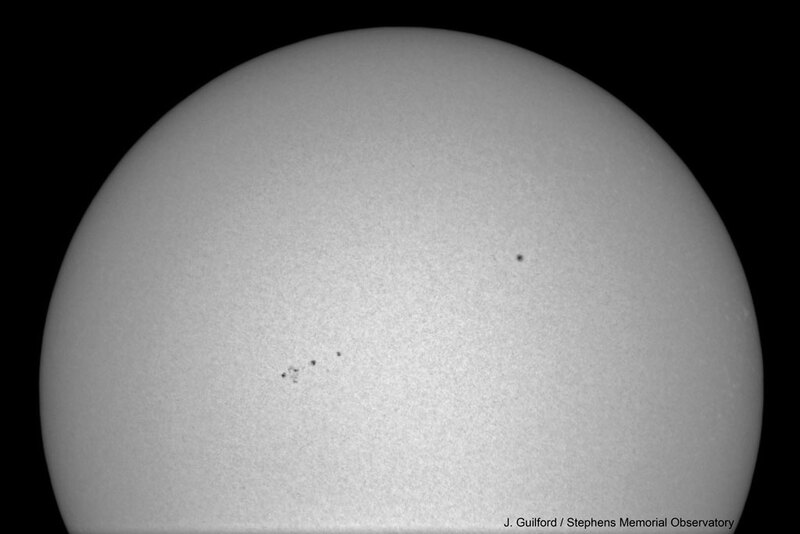 NOTES: Sunspots in this image are #2387 (L) and #2386 (R). For more information on the Sun’s photosphere and what can be seen there, visit this page at NASA/ Marshall Space Flight Center.